For 25 years UNLV basketball fans have been clamoring for a rematch with Duke after the Blue Devils stunned the undefeated and reigning national champion Runnin’ Rebels, 79-77, in the semifinals of the 1991 Final Four in Indianapolis. Saturday afternoon UNLV got its chance to try and avenge the most crushing loss in school history in the first ever college basketball game at the new T-Mobile Arena. Instead, the contest served as a very sad barometer of just how far two of college basketball’s iconic programs have grown apart. Final score: Duke 94, UNLV 45. And it really wasn’t that close. All-American guard Grayson Allen scored a career-high 34 points to lead fifth-ranked Duke (10-1) to its eighth straight victory in the fourth-annual MGM Grand Showcase before a standing room only crowd of 19,107. Sophomore guard Luke Kennard finished with 16 points, freshman forward Jayson Tatum added 13 points and senior forward Amile Jefferson had his 14th career double-double with 10 points and a game-high 12 rebounds for the Blue Devils who shot 58.7 percent from the floor, including 70 percent (21-of-30) in the second half. HOW IT HAPPENED: Very quickly. Allen, who came in shooting just 35.7 from the field while battling turf toe, had 12 points on 5-of-7 shooting as Duke bolted to a 20-3 lead in the first seven minutes. The 6-foot-5 junior had 15 points by halftime, including a vicious tomahawk dunk on the end of a drive that worked the crowd into a frenzy. 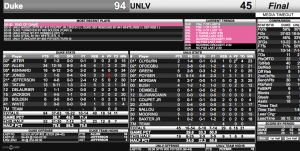 UNLV (5-4), which had 13 turnovers in the first 14 minutes and trailed by as many as 21 points in the first half, hit four 3-pointers in the final five minutes to close to within 42-26 at halftime. But Duke opened the second half with a 7-0 run to quickly push the lead back up to 23, 49-26, and then blew the game open with an 18-0 run capped by a Kennard 3-pointer to make it 71-32 with 10:31 to go. WHO STOOD OUT: Allen looked like a future NBA lottery pick, finishing 12-of-16 from the floor, including 6-of-9 from 3-point range, in 29 minutes of action. Many were open looks beyond the arc against weak UNLV defense. When the Rebels tried to come out and guard him, he, like has been a pattern for opposing guards this season, simply put the ball and drove by alleged defenders for dunks. QUOTES TO NOTE: “We did a lot of good things today. The main thing we did was we were passionate about playing today. I really liked that. 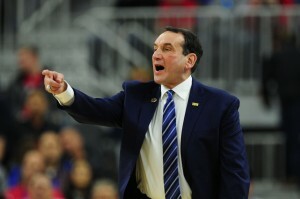 And Grayson was Grayson.” – Duke coach Mike Krzyzewski. “We ran into if not the best … that’s a Final Four team there.” – UNLV coach Marvin Menzies. UP NEXT: UNLV returns to the Thomas & Mack Center on Wednesday where it will host Incarnate Word from the Southland Conference at 7 p.m. NOTABLE: Sophomore guard Jalen Poyser was the only Runnin’ Rebel to score in double figures, finishing with 16 points, including 4-of-8 from 3-point range, but also had a game-high five turnovers. … Duke held UNLV to a season-low 29.6 shooting (16-of-54). … The Blue Devils finished with a 40-29 rebounding edge and a huge 50-16 advantage in points in the paint. … The Runnin’ Rebels finished with zero fast break points compared to six for Duke. … Former Bishop Gorman star Chase Jeter started his sixth game of the season for the Blue Devils and had two points, three rebounds and two blocks in 15 minutes of action. … UNLV had season lows for assists (six) and made field goals (16). 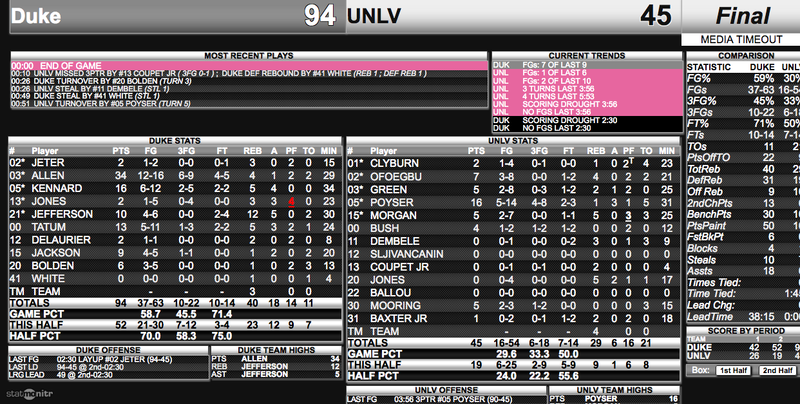 … The 49-point losing margin was eight off UNLV’s school record of 57 set in 1971 at Houston, 130-73.